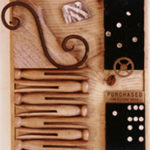 A group of unique and diverse artists whose primary focus is to create and promote assemblage art. I am compelled to collect found objects such as driftwood and various materials from the beach, also found and acquired objects. I then transform them into compositions or assemblages. My interest in these objects is their inherent history with people and nature and their relationship to us and the environment. These materials, both human-made and natural, have been cleansed and sculpted by the elements of time and the ocean. I then reintroduce them, giving them a completely new identity as art. Finding them on the sand, cast out, abandoned or lost and overlooked by people because they possess no intrinsic value, purpose or meaning – gives them a mystique of nothingness. I like making something meaningful from nothing. These compositions are abstract landscapes that express the mystery of spirituality in regards to humanity, nature and life. I am compelled to collect found objects such as driftwood and various materials from the beach, also found and acquired objects. I then transform them into compositions or assemblages. My interest in these objects is their inherent history with people and nature and their relationship to us and the environment. These materials both human-made and natural, have been cleansed and sculpted by the elements of time and the ocean. I then reintroduce them, giving them a completely new identity as art. Finding them on the sand, cast out, abandoned or lost and overlooked by people because they possess no intrinsic value, purpose or meaning – gives them a mystique of nothingness. I like making something meaningful from nothing. These compositions are abstract landscapes that express the mystery of spirituality in regards to humanity, nature and life. 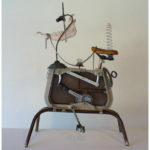 2013 “Found Objects as Art” Long Beach Arts, Long Beach, CA, Second place award. 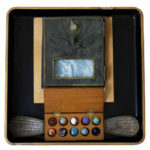 2009 “Orange County Fair Professional Exhibitions”, Assemblage Catagory, 1st, 2nd & 3rd place.